(Nanowerk News) IBM scientists today unveiled two critical advances towards the realization of a practical quantum computer. 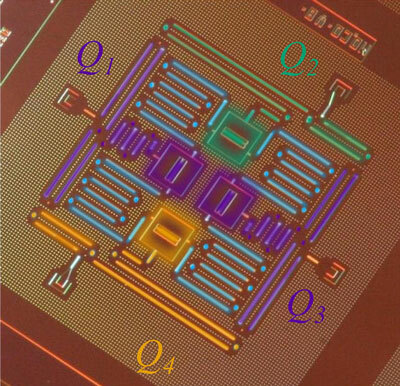 For the first time, they showed the ability to detect and measure both kinds of quantum errors simultaneously, as well as demonstrated a new, square quantum bit circuit design that is the only physical architecture that could successfully scale to larger dimensions. The IBM breakthroughs, described in the April 29 issue of the journal Nature Communications ("Demonstration of a quantum error detection code using a square lattice of four superconducting qubits"), show for the first time the ability to detect and measure the two types of quantum errors (bit-flip and phase-flip) that will occur in any real quantum computer. Until now, it was only possible to address one type of quantum error or the other, but never both at the same time. This is a necessary step toward quantum error correction, which is a critical requirement for building a practical and reliable large-scale quantum computer.